Here at last is an anthology that is not simply a collection of texts, but a carefully crafted tool for teaching and learning. This concise, single-volume, edition includes all the features of the longer volumes, but with a manageable amount of literature that can be covered in a single semester comprehensive survey course. 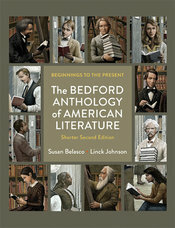 With engaging author and selection introductions and generous gloss notes, The Bedford Anthology of American Literature, Shorter Edition, helps students read, appreciate, and understand American literature. The unsurpassed illustration program helps students grasp the cultural, material, and social conditions in which literary works are produced. Several innovative features supply additional contexts for the literature, while others help students reflect on why American literature is relevant and worth reading today.